Northern Provincial Industrial Exhibition has been organized by Department of Industries commenced on 31 July 2014 at Jaffna Central College. The exhibition was organized for the purpose of promoting local products as well as increasing marketing opportunities. 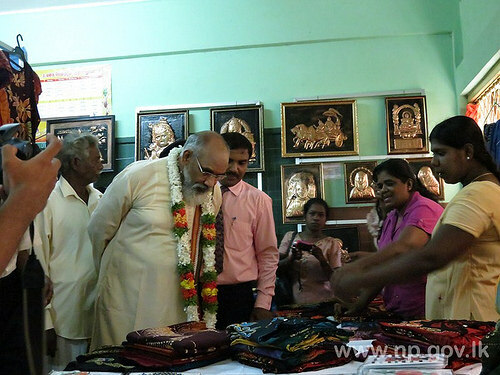 Chief Minister of Northern Provincial Council Justice C.V.Wigneswaran graced the exhibition as Chief Guest and inaugurated the exhibition. Chief Secretary, Northern Province, Mrs.R.Wijialudchumi also graced the occasion as special guest. This exhibition will be held on 31st July and 01st of August 2014. Exhibits and displays are categorized into 03 main categories; such as processing and sales stalls, Handloom and Handicraft Exhibition and competition stalls and business centre. Coir based products, pottery based products, food processing, carpentry based products, Handloom products, sea shell products and Palmyrah based products are important exhibits. Chief Minister addressed the gatherings and visited every stall and had a casual chat with the gatherings. The Selected exhibits (Handicraft & Textile) in Provincial level will be send to National level exhibition & competition conducted by the National agencies of National Craft Council & Textile Department Colombo. Provincial Council members, Secretaries, Deputy Chief Secretaries, Heads of Departments, Provincial council staffs and public visited this exhibition. 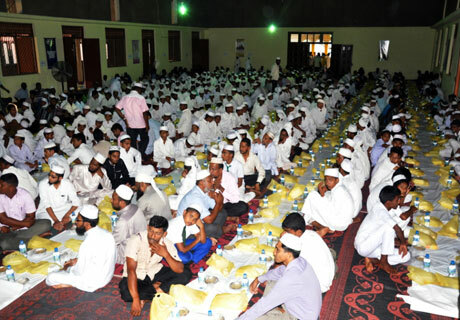 The Iftar Ceremony was organized by Hon. M.S.Uthumalebbe, Provincial Minister of Road Development, Irrigation, Housing & Construction, Rural Electrification and Water Supply and celebrated at the Hindu Cultural Hall, Trincomalee on 18th of July, 2014 at 5.00 pm. Hon. Governor, Eastern Province, Rear Admiral Mohan Wijewickrama, Hon. A.L.M. Athaullah, Minister of Provincial Council and Local Government, Hon. R. Sampanthan, TNA Leader, Members of the Parliament, and Hon. Ministers, Opposition Leader & Members of EPC, Secretaries, Deputy Chief Secretaries, Heads of Departments and Officers of Eastern Provincial Council, Commanders from all three forces, Religious Heads, Political Leaders, Heads of Traders Organization and people participated at this Ceremony. 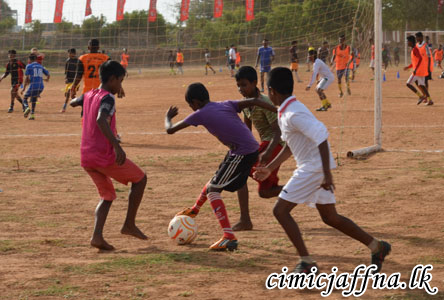 Making a history in the field of football in Jaffna, a team of experienced coaches and players from the USA arrived in Jaffna to conduct coaching camps for youths and schoolchildren this week. With coordination of Security Force Jaffna (SF – J), Mr. Gregg Davis, Mr. Evan Davis, Charles Johnson and Rodney Petersheim with their team leader Mr. Mathew Billman of Soccer Outreach Association, Pennsylvania conducted a three day coaching camp at Durayappah Stadium on 21st, 22nd and 23rd of July. Commander Security Force Jaffna Major General Udaya Pererra attended the inauguration ceremony on Monday (21). About 375 youths from different leagues in Jaffna, Valikamam and Islands administrative divisions and schoolchildren took part in the programme. One motive of organizing this sports camp is to inculcate qualities such as patience, equality, courage and acceptance of victory and defeat alike. It helps eradicate war mentality and assist the process of reconciliation. A similar programme which gives training to players in Thenmaratchci and Vadamaratchi administrative divisions will be held at St. Michael’s grounds in Nelliady from 25th to 27th instant. President Sri Lanka Football Federation Mr. Ranjith Rodrigo assisted the Army to organize the coaching camp. 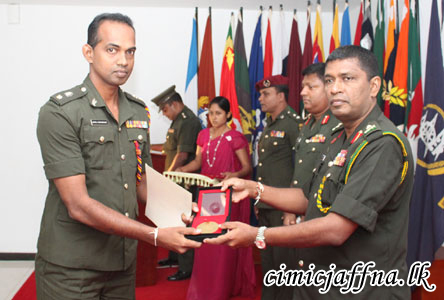 Commander 553 Brigade Colonel Vijith Subasinghe coordinated it on behalf of the Security Force Jaffna. A twelve days Sinhala Language Improvement programme has been commenced on 19th June 2014 at MDTD Auditorium. To improve the language skills for government staff Management Development Training Department (MDTD) conduct this programme with the collaboration of National Institute of Language Education and Training (NILET). The Programme has been ceremonially inaugurated by the Chief Guest of Mrs. J.J.Muraleetharan, Deputy Chief Secretary – Personal & Training, EPC, Mr.Prasath R.Hearth, Director General, NILET and Mr.G.Gopnath, Assistant Director, NILET. Northern Province Trilingual Center is scheduled to conduct Sinhala and English classes in Kilinochchi in coming August. 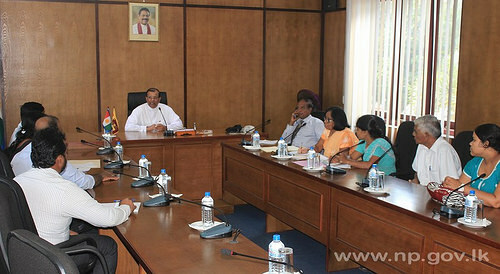 A meeting in this regard was held at Governor’s Secretariat in Jaffna on 22nd July under the chairmanship of Governor of the Northern Province GA Chandrasiri. The Principal of the Trilingual Center and resource persons took part at this discussion. Secretary to the Governor L.Ilaangovan was also present at this meeting. The six day training programme organized by Security Force Jaffna (SF – J) for senior Army officers serving in Jaffna on Mass Communication and Mass Media successfully ended on 19th July with award ceremony at Kankesanthurai Thalsevana Holiday Resort. Brigade Commanders, Battalion Commanders and senior staff officers attended the course organized on concept of Commander SF – J Major General Udaya Perera. Jaffna intellectuals such as Rev. Fr. 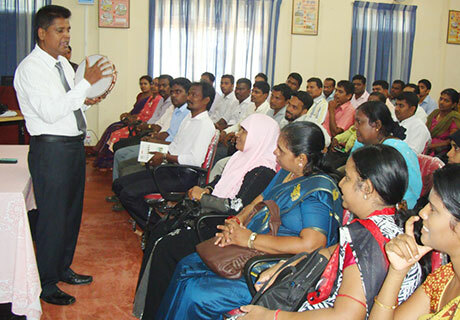 Ruban Mariyampillai, Lecturer in mass communication and mass media of Jaffna University and former Vice Chancellor of Jaffna University Prof. S. Balasundarampillai, Military Spokesman Brigadier Ruwan Wanigasooriya and journalists from Colombo conducted lectures and practical sessions during the course. Maj. Gen. Udaya Perera and senior officers handed over certificates to participants and awards to student officers who showed best performance. 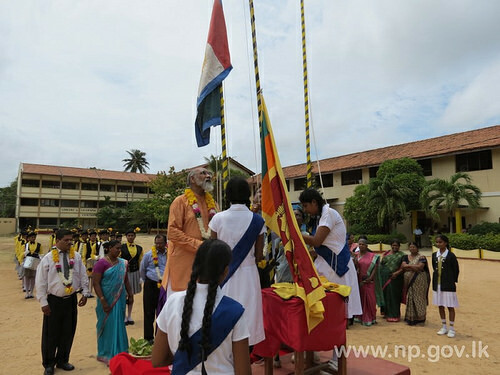 Foundation stone laying ceremony for the Mahindothaya Technological Faculty was held in J/ Vembadi Girls High School on 30 June 2014. Principal of the school Mrs.V.Shanmukaratnam headed the event. Chief Minister of Northern Provincial Council Justice C.V.Wigneswaran participated as Chief Guest and laid down the foundation stone. S.Sathiyaseelan – Secretary to the Ministry of Education, Teachers, Students and Parents also participated in this event. Opening ceremony of Dept. of Rural Industries newly constructed Sales Centre and East in Circuit Bungalow was held at Pasikkuda on 12th of July 2014. Hon. Minister of Agriculture, EPC Eng. Z.A.Nazeer Ahamad was the Chief Guest at this ceremony. Mr. K.Pathmanathan, Secretary of Ministry of Agriculture, EPC, Dr. T.K.Thavarajan, Provincial Director of Dept of Animal Production and Health, Mr.T.M.L.D.Tennekoon, Provincial Director, Rural Industries,EPC, Mr.M.M.Nowfees Assistant Director, District office, Dept. of Rural Industries, Batticoloa , foreign Investors, Hotel owners and staff also participated at this ceremony. Newly constructed Children Park and playground were inaugurated in Adampan, Mannar on 28 June 2014. S.Varaprakasam, Chairman, Manthai West Pradeshiya Sabha headed the event.Chief Minister of Northern Provincial Council Justice C.V.Wigneswaran and Minister of Industry and Commerce Rishad Bathiudeen have participated as Chief Guests and declared opened the children park and the playground. Subsequently trees were planted in the playground honouring guests participation. Then Northern Province Chief Minister inaugurated a football competition between Manthai West Divisional Secretariat team and Madhu Deputy Government Officer team. After this, Chief Guests have given away prizes and scholarships to School students, and Sportsmen. Children Park and Sports playground built under NELSIP project for Rs. 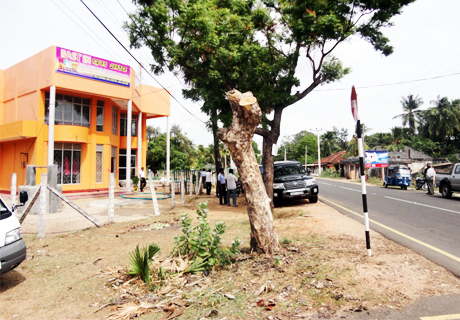 9.1 Million and implemented by Manthai West Pradeshiya Sabha. S. Sritharan, Member of Parliament, B.Deniswaran, Minister of Fisheries, Transport, Trade & Commerce and Rural Development, Provincial Council members, Secretary to the Chief Minister S.Thiruvakaran, Manthai West Pradeshiya Sabah Secretary and other officials were also present at this opening ceremony. Australia’s Immigration Minister Scott Morrison has reportedly made a secret visit to the war-torn Sri Lankan region of Jaffna during his whirlwind stop in the South Asian nation. The ABC understands Mr Morrison arrived in Jaffna by helicopter yesterday afternoon after attending the inauguration of two customs boats donated by Canberra to Colombo. Mr Morrison was accompanied by the Australian High Commissioner and other Australian officials. Jaffna was the scene of some of the worst fighting during the civil war and some Tamils there say they still face persecution. The major Tamil political party in Jaffna says Mr Morrison met only with the governor of Northern Province in Jaffna, GA Chandrasiri, who is a presidential appointee, and not with any Tamil politicians or civil society groups.